March | 2012 | Food E.
I’m gonna confess something to you guys: if ever I’m having people over for a meal or drinks or whatever, I will often scan my cupboards first to find out what I have to get rid of and then plan my menu around that. Now don’t get me wrong, I’m not serving old deli meat and baking soda, but if I have asiago cheese that I don’t know what to do with, or half a can of cashews that need to be eaten, I’m using ’em. Case in point: last weekend’s easy starter. Place almonds in a skillet and heat over medium heat. Constantly shake the almonds over the heat until they are fragrant. Remove from heat. Place baguette slices on a cookie sheet in one single layer. 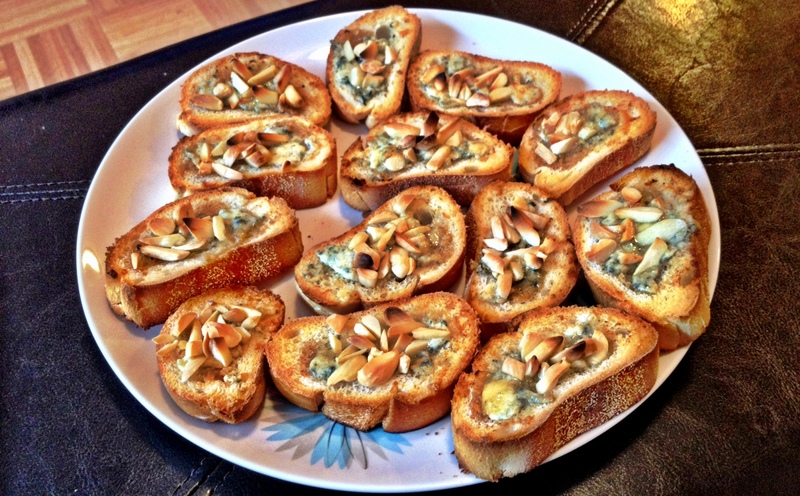 Sprinkle blue cheese on toast, drizzle honey, and top with almonds. Place cookie sheet under a pre-heated broiler for 3 minutes. It’s no secret to those devoted Food E. readers that I love risotto. It’s easy to prepare for company, it’s impressive to present, and it’s one single dish to make sure is ready by meal time instead of two or three separate dishes that you have to coordinate. Also, most people love it. This past weekend The BF and I had some friends over for dinner and I prepared this risotto with a small arugula salad with cucumbers to start. The original recipe calls for calamari and if you have a grill or a grill pan, I’d definitely suggest trying it. I went with calamari’s good friend, shrimp. Heat chicken stock over medium-high heat until it simmers, lower heat and leave the stock on a low simmer. Heat 2 tablespoons of olive oil in a large pot over medium heat and sautee leeks until softened but not brown, about 7-8 minutes. Remove leeks from the pot and set aside on a plate. Add 1 tablespoon of olive oil to the pan and add rice. Stir rice for one minute until fully coated with oil. Add white wine to the rice and stir until liquid is almost completely absorbed, around 3 minutes. Add one cup of stock and occasionally stir. Keep adding stock cup by cup until one cup remains, around 20 minutes*. Add lemon juice, zest, leeks, peas, and last cup of stock to the rice and stir until incorporated. When you add the last cup of stock, heat remaining two tablespoons of olive oil in a large skillet over medium heat and place shrimp in the pan. While the shrimp are cooking: add cheese and butter to the risotto and stir. Turn the heat off of the risotto. Flip the shrimp in the skillet after 3 minutes, cook for another 3 minutes on the other side. 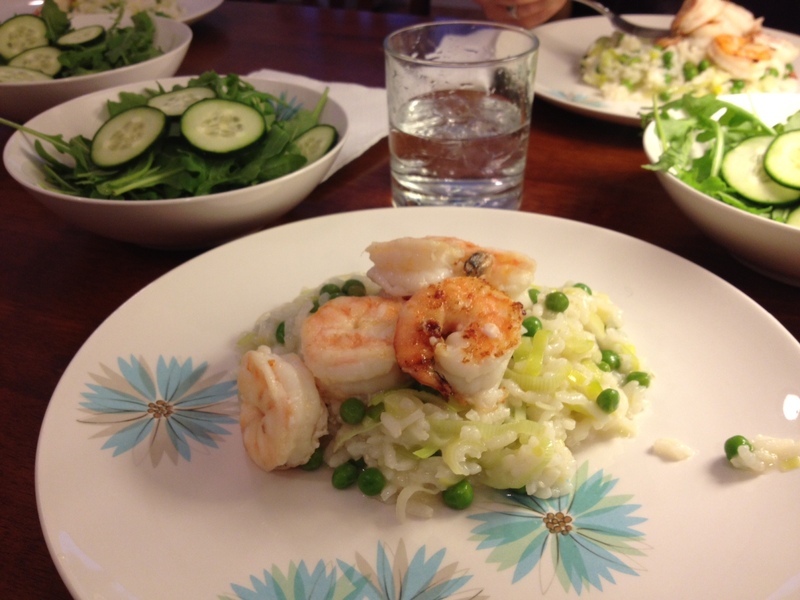 Plate the risotto and place shrimp on top. 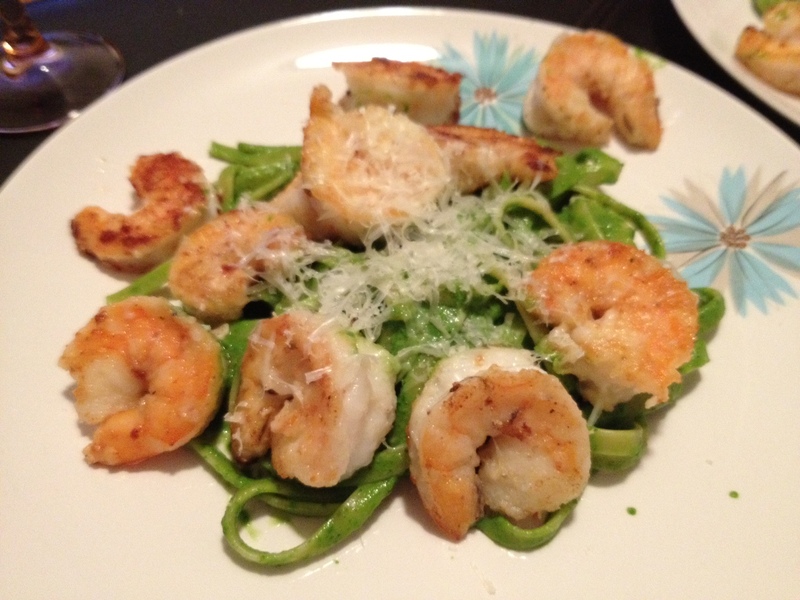 Garnish with extra grated parmesan cheese if desired. *Note: the best way to test your risotto for doneness is to taste it. Grains should be just barely hard in the center when you turn off the heat to complete the cooking process.